I must confess - I've been in a bit of a funk for the past few months. I could blame it on moving, I suppose. I love our house, but I'm one of those cranky and OCD Type As who needs everything in its place to feel peace in my own house. It's getting there, and I'm definitely not putting too much pressure on myself to be an over-achiever with settling in. But there are moments that I stop in my tracks and just can't wrap my frantic little brain around all the zillion things screaming at me to accomplish. So it's no shocker that my list-making tendencies are in serious overdrive right now. Oh, and Christmas is drawing near? My most favorite and the dreamiest of holidays? I've got 3 separate lists going for that. Lists, lists, lists. I don't love having them but they definitely help keep my sanity from inching its toe near that crumbling cliff of no return. Speaking of crumbs (smooooth segway, no? ), while I'm not jotting down every task that pops into my head, I'm daydreaming about making Christmas goodies. And I seriously can't get these marshmallows out of my brain. They're like a song stuck on repeat - marshmallows, candy cane, marshmallows, chocolate, marshmallows, marshmallows, marshmallows - and I'm pretty sure the only remedy is just to make the things. And then to eat half the batch, while standing over the sink and no one but the backyard deer and squirrels can see me. "Look, Bo - I made marshmallows again! No... The recipe didn't make more last year. I don't know why you think there should be more. Now. Please go give these to the neighbors so that I can continue sticking to my diet. Ahem." So, because I can't get these delicious little puffs out of my head, and because they're just too freaking awesome of a recipe not to revisit, I'm doing a rewind. Just a little nudge to remind us all that these are yum, these are easy, these are a new holiday tradition in my family. I've posted the recipe below, but the original post has oodles of photos of each step of the process. The instructions below look a bit intimidating and lengthy at first, but the steps are all fairly easy. And I really think it would be a fun project for kids to help out with! Now, if I could just get my Christmas letter written and mailed out, I could finally make these and let my little heart burst all over the place from joy. Messy, but joyful, indeed. Lightly butter or spray with a non stick vegetable spray the bottom of a 9x13 pan. Line the bottom of the pan with parchment paper. Then sift about 3 tablespoons of confectioners' sugar onto the bottom of the pan (this will help release the set marshmallow from the paper). Set pan aside. Place 1/2 cup cold water into the bowl of your electric mixer that is fitted with a whisk attachment. Sprinkle the gelatin over the water and let stand until gelatin softens, about 15 minutes. Meanwhile, in a heavy two quart saucepan, place the sugar, corn syrup, salt, and remaining 1/2 cup cold water. Stir over medium heat until sugar dissolves and the mixture comes to a boil. Cover the saucepan with a lid and let boil for about three minutes to allow any sugar crystals to dissolve from the sides of the saucepan. Remove the lid and attach a candy thermometer to the side of the pan. Increase heat to high and boil, without stirring, until the syrup reaches 240 degrees F, about 10 minutes. Remove from heat. With mixer running at low speed, slowly pour the hot syrup into the gelatin mixture in a thin stream down the side of the bowl. Gradually increase the speed to high and beat until mixture has tripled in volume and is very thick and stiff and glossy, about 10 minutes. Add vanilla extract and beat to combine, about 30 seconds longer. 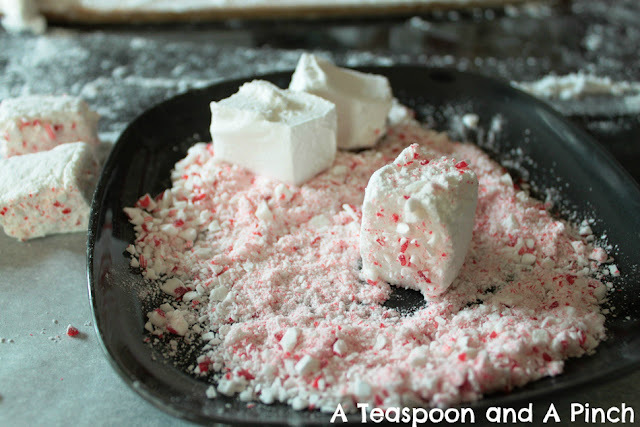 Scrape marshmallow mixture into the prepared pan and spread with an offset spatula or rubber spatula dipped in hot water. The mixture is very sticky so just smooth it out as best as you can. Dust the top of the marshmallow with another 3 tablespoons of confectioners' sugar and let stand, uncovered, at room temperature until set, about 12 hours. Remove the marshmallow from the pan by first running a small sharp knife around the edge of the marshmallow to loosen it from the pan. Invert the pan onto a large cutting board or baking sheet. You might have to use your fingers to help loosen the marshmallow from the pan. 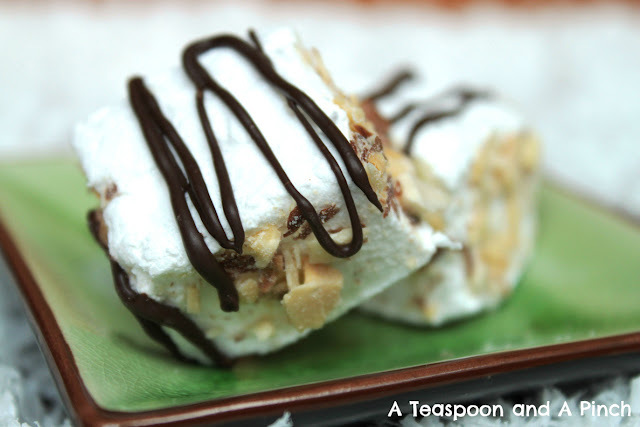 Peel off the parchment paper (the marshmallow will be sticky) and dust the top of the marshmallow with confectioners' sugar. 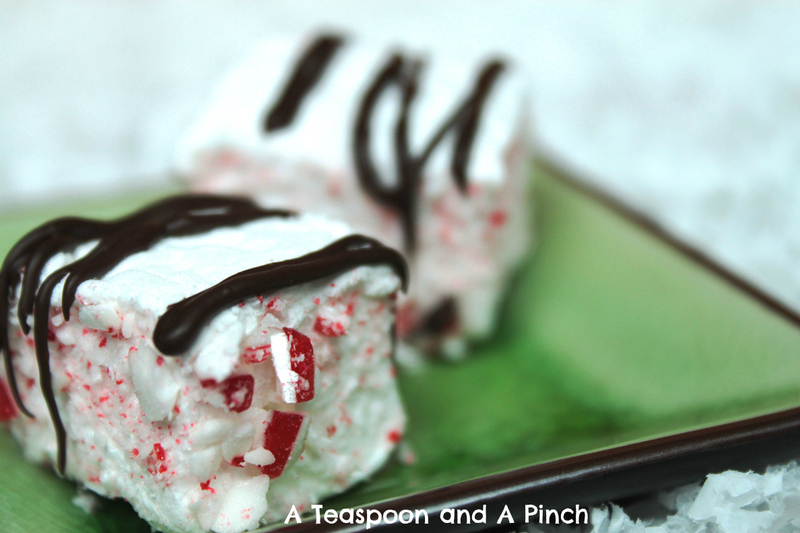 Cut the marshmallow into squares using a pizza roller or a sharp knife. Dip the cut sides of the marshmallows in additional confectioners' sugar. Shake off excess sugar and store the marshmallows in an airtight container, at room temperature, for up to two weeks. Why do homemade marshmallows scare me? They are so pretty but look way to delicate for me to make. I was scared of them for two years before I finally tried making them. But they're surprisingly easy and no-fuss! Do you have a thermometer?